* Mariell's sparkling hand-made Wedding Comb boasts a mix of brilliant Crystals & Soft Ivory Pearls on flexible wires. * The crystal design is 2 1/2" w x 1 3/4" h.
* This gorgeous bridal comb looks amazing when worn in multiples for a bold fashion statement! * This delicate Wedding Hair Comb by Mariell offers a simple yet dazzling way to enhance any bridal hairstyle. * Retailers and stockists should keep this hair comb on hand for the reorders that this popular comb is guaranteed to bring. 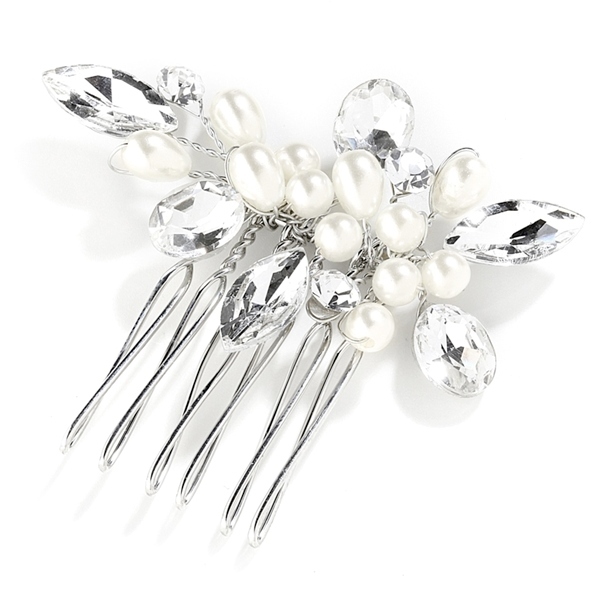 * The attractive wholesale price makes this pearl and crystal comb a great hair accessory for any bride or bridal party!